This chapter introduces you to Image Ops, an API that enables you to read and write raw pixels within your JavaFX applications. You will learn how to read pixel from images, write pixels to images, and create snapshots. Image: Represents a graphical image. This class provides a PixelReader for reading pixels directly from an image. WritableImage: A subclass of Image. This class provides a PixelWriter for writing pixels directly to an image. A WritableImage is initially created empty (transparent) until you write pixels to it. PixelReader: Interface that defines methods for retrieving pixel data from an Image or other surface that contains pixels. PixelWriter: Interface that defines methods for writing pixel data to a WritableImage or other surface that contains writable pixels. PixelFormat: Defines the layout of data for a pixel of a given format. WritablePixelFormat: A subclass of PixelFormat, representing a pixel format that can store full colors. It can be used as a destination format to write pixel data from an arbitrary image. The following sections demonstrate this API with examples that you can compile and run. You may already be familiar with the javafx.scene.image.Image class, which (along with ImageView) is used in JavaFX applications that display images. 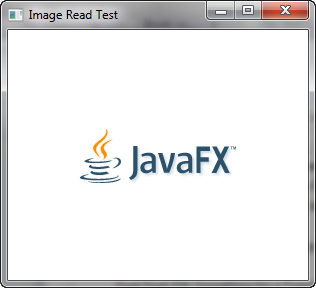 The following example demonstrates how to display an image by loading the JavaFX logo from oracle.com and adding it to the JavaFX scene graph. Image image = new Image("http://docs.oracle.com/javafx/"
Running this program will produce the image shown in Figure 10-1. Description of "Figure 10-1 Displaying an Image"
Now, let's modify this code to read Color information directly from the pixels. You can do this by invoking the getPixelReader() method, and then using the getColor(x,y) method of the returned PixelReader object to obtain the pixel's color at the specified coordinates. System.out.println("\nPixel color at coordinates ("
+ readX + "," + readY + ") "
This version uses nested for loops (that invoke the getColor method) to obtain color information from every pixel in the image. It reads in pixels one at a time, starting in the upper left corner (0,0) and progressing across the image from left to right. The Y coordinate increments only after an entire row has been read. Information about each pixel (color values, opacity and saturation values etc.) is then printed to standard output, proving that the read operations are working correctly. You may be tempted to try modifying the color of each pixel and writing that to the screen. But keep in mind that Image objects are read-only; to write new data, you need an instance of WritableImage instead. Now let's modify this demo to brighten each pixel, then write the modified result to a WritableImage object. // Now write a brighter color to the PixelWriter. 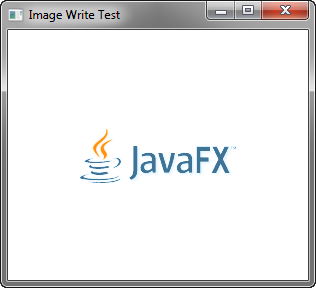 This version creates a WritableImage initialized to the same width and height as the JavaFX logo. After obtaining a PixelWriter (for writing pixel data to the new image), the code invokes the brighter() method (to lighten the shade of the current pixel's color), then writes the data to the new image by invoking pixelWriter.setColor(readX,readY,Color). Figure 10-2 shows the result of this process. Description of "Figure 10-2 A Brighter Logo, Stored in a WritableImage Object"
Description of "Figure 10-3 Writing Pixels to a Canvas"
This demo does not read data from an existing image; it creates a new WritableImage object entirely from scratch. It draws several rows of multi-colored 10x10 rectangles, the color data for which is stored in an array of bytes representing the RGB values of each pixel. This method sets the R and G values for each pixel of the rectangle (B is always 0). These values are stored in the imageData byte array, which holds a total of 300 individual bytes. 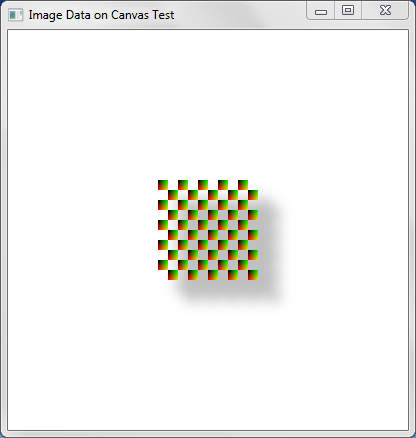 (There are 100 pixels in each 10x10 rectangle, and each pixel has R, G, and B values, resulting in 300 bytes total). Here, the PixelWriter is obtained from the Canvas, and a new PixelFormat is instantiated, specifying that the byte array represents RGB values. The pixels are then written an entire rectangle at a time by passing this data to the PixelWriter's setPixels method. The javafx.scene.Scene class also provides a snapshot method that returns a WritableImage of everything currently shown in your application's scene. When used in conjunction with Java's ImageIO class, you can save the snapshot to the filesystem. As you can see, invoking scene.snapshot(null) creates a new snapshot and assigns it to the newly constructed WritableImage. Then (with the help of ImageIO and SwingFXUtils) this image is written to the file system as a.png file.